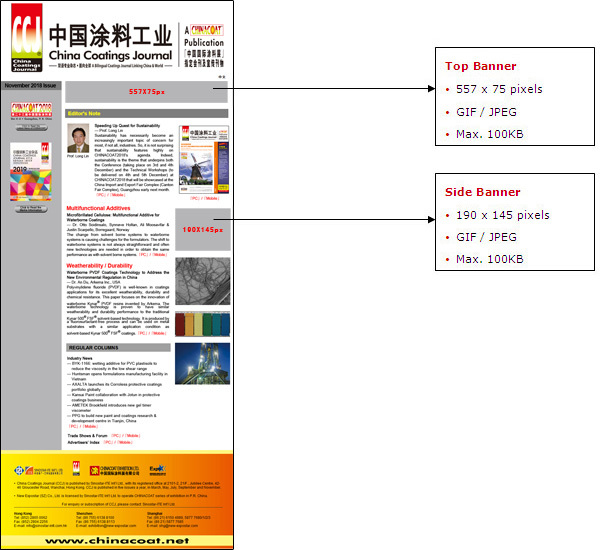 All advertising rates quoted in RMB¥ are subject to 6% VAT. Rates are net to advertisers and for advertising space only. Other sizes or special formats are available for CCJ, e.g., belly band, gatefold, poster, etc. Rates and specifications to be provided upon request. Each issue of CCJ is sent electronically to our subscribers and CHINACOAT visitors. Advertisers can now place your ad in the electronic mail so that your messages can be seen by more prospects who are actively searching for information that is related to your company's products and services. Advertisement can link to the requested URL. Advertising space will be reserved on a first-come, first-served basis.